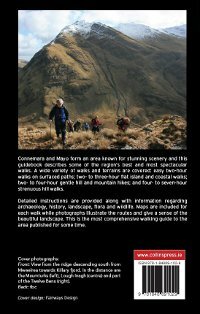 Paul’s book “Connemara and Mayo - a Walking Guide” (published by the Collins Press) gives detailed instructions and background information for 33 walks. The walks suit all levels of ability, mainly along the Wild Atlantic Way. Its a compact 152-page book printed on high quality paper. It is illustrated throughout with exciting photographs including some spectacular shots by Clifden native and musician Sean O'Farrell along with Clifden-based designer Brigid Sealy. We can supply signed copies of “Connemara and Mayo - a Walking Guide” and post them to you. Signed copies cost €15 (including postage in Ireland; postage elsewhere is €5 extra). Books are available in Clifden ( All Things Connemara, Love Connemara), The Lough Inagh Lodge Hotel, Ferron's shop Roundstone, Letterfrack Country Shop, Leenane (Sheep and Wool Centre, The Leenane Hotel, Killary Fjord Boat Tours and Portfinn Lodge), Joyce's Craft Shop Recess, Inishbofin (Heritage Museum), Oughterard (John P Keogh & Sons, Rocky Mountain High), Kylemore Filling Station, Peacocks Maam Cross, Brigit's Garden Roscahill, Louisburgh (Books@One and Staunton's Chemist), and in Delphi Lodge. “Connemara and Mayo - a Walking Guide” is available for local distribution. If you are a tourist provider or retail business and would like to sell the book, please email Paul (see left) and he will call you. There is a new, higher fence at Ben Lettery youth hostel, so if you are doing walk 4 in the book, you will have to descend about 200 metres to the East of the hostel, where there is a gate you can use to access the old road. Please don't damage the fence by attempting to climb over it. The grid reference for the gate is L 77832 48251. Following a very bad recent experience, we advise anybody attempting Walk 9 "Doughruagh and Lemnaheltia" to be extremely careful on the N59 near Kylemore Abbey. While the walk description warns of the danger of this narrow and windey road, the high volume of summer traffic- including many wide tour busses - makes it especially hazardous (particularly for a large group, or if you are expecting signs for the way up onto the mountain). During busy times we would recommend alternative nearby Walks 5, 6, 7, 8 which are of a similar level (but also have some danger). A Kildare-based reader has pointed out an instruction error in Binn Chaónaigh in Walk 18 "Maumeen to Maumahoge" in first print run. On page 80, 2nd last paragraph, the book says "From the cairn carefully turn to the east...". In fact it should read "From the cairn carefully turn to the west...". Fortunately the map on page 79 is correct. Apologies for this error. This error has been corrected in the recent reprints. Given the large number of instructions in the book, I would be surprised if there is not another error such as this one. Please email us if you spot one. Thanks very much to the Westport hill walker for the rapid and very positive feedback on the book. This hiker was also very quick to spot the omission of some peak heights. Unfortunately, on some of the maps, we didn’t get in all of the heights. I did not have full control over the difficult process of developing the maps. Hopefully I will for my next book. The book was recommended by the Sunday Independent in their useful article on Spring walks in Ireland in April 2019. (see walk no. 25, Benlettery, Bengower and Benglenisky, Co Galway). The book is available to purchase from the Guide Book page). It's great to realise this book is working in unusual ways. Thanks to the person from Renvyle who has been using my book as bedtime reading. That's not exactly how I had intended it, but hey, I like the idea. Another person says the book took her and her family to Omey Island for the day, something they hadn't done for a while. They didn't follow the Omey walk described but they visited the Holy Well and had a lovely day which is great. However, we have recently been disappointed to learn about a bad experience on the main N59 road (see above). While the Connemara roads are always dangerous to walk on, tourist traffic makes them very busy in summertime and we urge all users to be extremely careful. Several people have asked about the "next book". There have been some interesting suggestions e.g. "Volume 2". I already have a couple of walks written up that did not make the cut in "Connemara and Mayo". In addition I have already written up a couple of new walks (outlined on this site). While at present I have no definite plans for a second book, if I do I will probably call it "Mayo and Connemara ...." :).